Iced tea was basically invented at the 19004 World’s Fair in St. Louis. This copper pitcher from Crate & Barrel would be perfect for some iced tea! Kansas City has more fountains than any other city in the world with the exception of Rome. For the person on your list with an awesome backyard, what about this fountain from Home Depot! Anheuser-Busch is the largest beer producing plant in the nation and located in St. Louis. For the family members not into the craft beer trend, make sure you have some Bud Lights on hand! 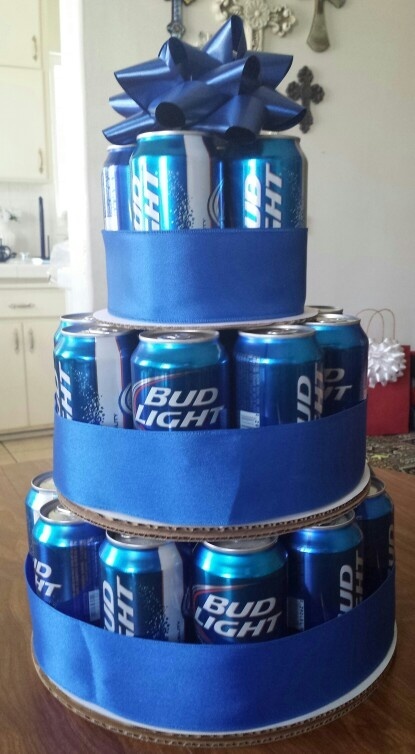 Beer cake idea from Pinterest. The most visited place in Montana is Glacier National Park and after looking at this picture I now want to visit Montana. Plan a trip here. Of course Montana has the highest population of elk’s in the states. I was looking for a sweet elk sweater, but decided a faux elk head was better. Note that I **think** this is an elk - it’s just the largest member of the deer family - but if you are like a true elk buff and this isn’t an elk, I’m sorry. A lot of the Montana facts were around animals, so after reading a bit I wasn’t surprised to learn that Montana has the most different species of mammals. Also the elk, deer and antelope populations outnumber humans! One mammal that still roams in Montana is the buffalo. This sparked a gift that is still easy to pick up in store - a buffalo plaid print shirt! Guess what’s in Nebraska that you can’t find anywhere else in the world? A roller skating museum. How fab are these adult Hello Kitty skates!? Spam is made in Nebraska and it is one of the most perfect gifts for a white elephant exchange! Chimney Rock, located in the state, was the most often mentioned landmark in journal entries by travelers on the Oregon Trail. This fact gives me an excuse to add this awesome shirt!